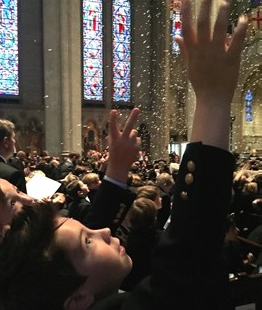 Fall at Cathedral School for Boys concludes with the Festival of Lessons & Carols. This year's Lessons & Carols service will take place on Friday, December 21 at 8:45 a.m. Boys should come to school in full dress at the regular arrival time between 8 a.m. and 8:15 a.m. and report directly to their classrooms. Acolytes, Ushers, and Student Council must arrive at the Cathedral at 8 a.m. All parents and visitors should head directly to Grace Cathedral as the program begins there at 8:45 a.m. Dismissal will happen from classrooms following the service (run time: approximately an hour). There will be no childcare after the service. The entire school community is encouraged and welcome to join us for the Festival of Lessons & Carols. It is a wonderful way to kick off the Christmas break and close out the first half of the school year.